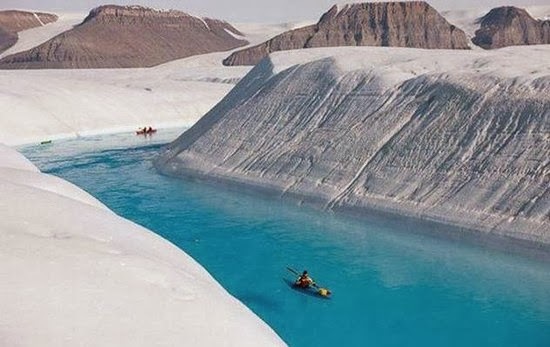 This river is heaven of kayaking in Greenland. This river is caused by the melting of Petermann Glacier which flows down to the low lying areas filling it with stunning blue water which is caused by the glacial silt. The pattern of the river changes in accordance with the season. Located midway between mainland Norway and the North Pole, it is comparatively warm due to the warming effects of the Gulf Stream, which makes this beautiful place completely habitable. Svalbard islands cover a total span of 62,050 sq km, 60% of it is covered with glaciers which ultimately terminates in the sea. The giant glacier Brasvellbreen located on Nordaustlandet stretches out for 200 km. the 20 meter high ice edge of this glacier is intersected by hundreds of melting waterfalls. They can be seen only in the warmer months every year. Found in the glacier ice, this cave is formed as a result of glacial mill or Moulin. The rain water is channeled into streams that enter the glacier at crevices, and the waterfalls melts a hole into the glacier while the pond water drains towards the low lying areas forming long ice caves with an outlet at the terminus of the glacier. The frozen water stream appears muddy but the top of the cave exhibits the deep blue color. Being one of the most accessible and best known arms of the Jostedalsbreen glacier, it is located in Norway and a part of Jostedalsbreen National park. It terminates into a small glacial lake which lies 346 m above sea level. 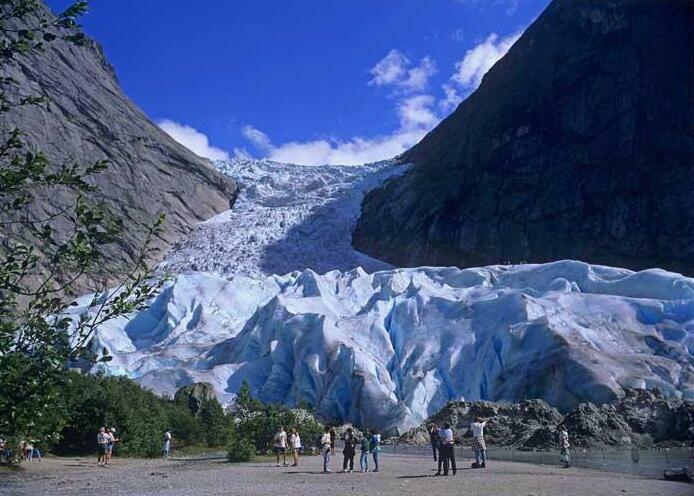 Many come to see the beautiful Briksdalsbreen glacier and waterfalls which are over thousand years of age. This stunning canyon was carved by melting water. It is 150 ft deep. The lines on the edge of the canyon are the marks left by stratigraphic layers of ice and snow laid down over the years. The black deposit in the bottom of channel is Cryoconite (powdery windblown dust) which is deposited and builds up on snow, glaciers or icecaps. Found in Northern Greenland it is grey zone at low elevation on the glacier which is incised by meltwater channels. It is located at an astonishing geographical location on the northeast coast of Greenland. 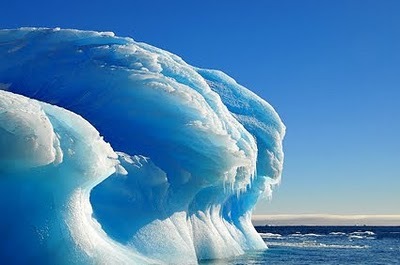 Located in Antarctica, it was first discovered by an American scientist Tony Travouillon in 2007. The formation is made up of blue ice, which clearly states that it was not created instantly from a wave of water but was built up slowly over time. It is blue in color because when light passes through the thick ice the red is absorbed and only blue is given out. Often seen on the icebergs of the Southern Ocean, the striped icebergs have multiple color bands, including yellow, brown, black and blue apart from the usual blue and green stripes. Icebergs are formed when big chunks of ice break and fall into the sea. Formed from fresh water the icebergs seem to react with the salt water of the sea, which freezes and forms a covering the iceberg with a crust creating a beautiful color band of different shapes and textures. 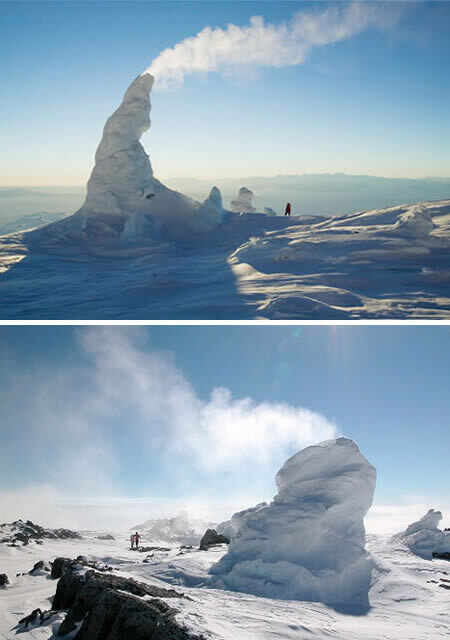 Mount Erebus in Antarctica is the only place where fire and ice meet mingling and creating something unique and amazing. It is a constantly active volcano, with hundreds of ice towers studding the flanks of 12,500ft. The towers are up to 60ft in height huffing and puffing steam into the south polar sky. Found near the town of Vail, Colorado, the enormous ice pillar is formed by the freezing of the waterfall especially in winter. The pillar measures up to 50m in height and the base measures up to 8m wide. Penitentes are beautiful ice spikes formed naturally found at high altitude plains especially on the Andes Ranges located 4000m above sea level. They are found in varying heights giving an impression of an ice forest.